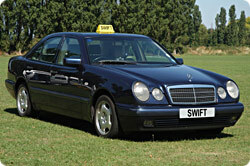 Executive Travel from Swift Fox Cabs - a high class service for your executive travel and corporate travel requirements. Choose Swift Fox Cabs for airport transfers, corporate events, conferences, sporting events, evenings out, stag parties and more. Our fleet currently stands at over 145 vehicles ranging from Mercedes saloon cars, MPV and People Carriers, which can seat up to 8 passengers. Our Mercedes Vito can carry 8 people and is equipped with a DVD player with multi screens. This vehicle also allows passengers to face each other for a more formal day out. The executive travel drivers are all fully uniformed and fully experienced in executive travel. We can provide newspapers and soft drinks. The driver can be yours for the whole day - only ready to leave when you have finished your enjoyable race day or other corporate day out. Maybe you just want to hire the driver for a few hours of site seeing around the beautiful countryside of Leicestershire. Give us a call now to discuss your individual requirements and let us take the stress out of executive travel.